4:30 am came way too soon this morning, but knowing I was starting my motorcycle trip was good motivation to not hit the snooze button. I am not one to jump out of bed and run out the door so I gave myself an hour to enjoy a good cup of coffee and get my things together. By 5:30 am the bike was loaded and I was rolling out the driveway. Oakland was quiet and empty as I rode up MacArthur Blvd. The normally busy street was deserted and quiet, amber street lights led me out to the freeway on ramp and I felt like I was escaping the city as I accellerated through the tunnel, merging on to I-80 eastbound. As I rode through the dark on a nearly empty freeway, I could see the heavy fog over the Berkley Marina. It was 61 degrees and felt refreshing. 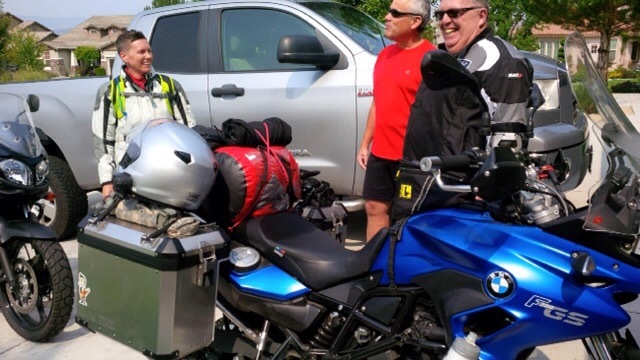 I was headed to Sacramento, to meet my buddy Crazy Mike who agreed to join me on my ride to the Sawtooths. The sunrise was amazing. It looked like Mars, rising up–I think the fires in Clear Lake gave it’s red globe appearance. It also seemed like it was so close, I’ve not seen the sun look that big before. It was fantastic and I enjoyed it as long as I could. About 10 years ago I saw a documentary on PBS that featured a man who raised baby wolves and set them out to the wild in the Sawtooth Mountains. The story was pretty cool, but I was more fascinated with the Sawtooth wilderness and promised myself I would go there someday. So, here I go! We stopped off in Reno for gas and it was only about two miles from my sister and bro in law’s house so we popped in to say hello. It was great seeing them and a nice little break. We headed off for our last 170 miles passing though the Nevada mountains and wide open grazing lands. I was surprised to actually see some green on the landscape and lots of freerange cows. 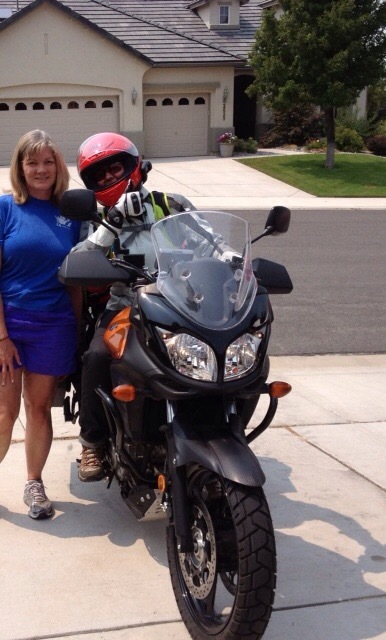 We rode into Winnemucca around 3 pm and were ready to relax, shower and find some food. We had some great fish tacos at the Toasted Tavern close to our hotel. Winnemucca is a a sleepy little town with a lot of pickup trucks and camouflage but it’ll do for tonight. A portion of the Oregon trail (The Applegate Trail) runs through Winnemucca and the Donner Party actually went through this area. They had no idea what was in store for them just 170 miles west. 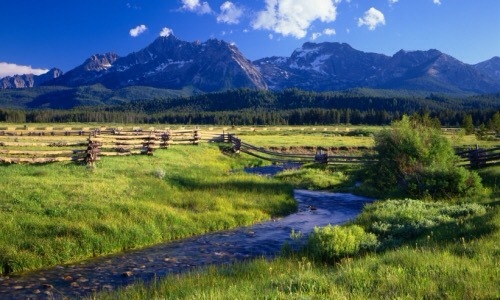 Tomorrow it’s the Sawtooth mountains or bust! We have about 380 miles to cover so we should make it around 5 pm or so to set up camp. We’ll be in pursuit of ghost towns, hot springs and curvy moutnain roads. There may be some delay in posts if I don’t have a connection but I’ll send them out evenutally. More to come! Glad you made it safely. Have fun tmrw! Can’t wait for the stories! Safe Travels Denise and Mike! Anxiously await your next post. Really neat description of your ride out of Oakland with the sunrise. It’s so cool that you created this blog to share the visual with us! Yes mom got it! I’ll be writing on the blog more when I get better reception. More soon! Loving it here. Hi Mom! Great to see you on here.